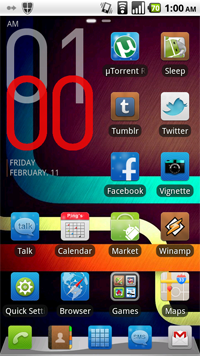 If you’re like me, you prefer that your Android looks as stylish as it works. Besides skinning your home replacement app or customizing your boot animation, there’s something even more rudimentary that can shift the whole motif of your phone: your wallpaper. Unfortunately, all wallpapers aren’t created equal: a user usually has to properly re-size an image to their phone’s specific resolution, transfer it to an SD card then crop it from within the phone. 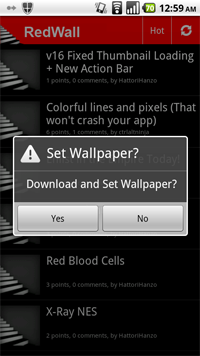 This, however, excludes the monumentous task of finding wallpapers that aren’t crap in the first place. I’ve found an app called RedWall that eliminates some of these frustrations. Reddit is a portmanteau of the words “Reddit” and “wallpaper.” In simplest terms, it scrapes a certain Reddit sub-board (/r/redwall) for images and allows you to set them as your phone background; images are downloaded, cropped and set in one swift motion. The backgrounds I’ve tried both look great and are sized appropriately; I haven’t had to worry about jagged pixels or misshapen images. This is a giant plus in my book, since there’s less work to do to get something great. Perhaps what’s most interesting about this app is that the wallpapers shown are influenced by the Reddit voting mechanics. Top “day”, “week” and “month” sortings show what’s been voted on the most in those time periods; if you have a Reddit account, you can go to the board and contribute yourself. 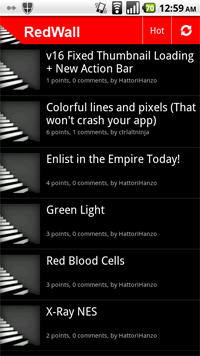 So I’d recommend getting RedWall (it’s free, with ads) and try out a few of their offerings. There’s an extremely good chance you’ll find something you like. Reddit is good like that. Matt Demers is Droid Life’s app guy, and would like to pay his respects to Brian Jacques, the author of the lovely Redwall books. Rest in peace, Brian. You can find Matt on Twitter, or e-mail him.